Starwest is very happy to offer Anise Star as part of our extensive line of organic wholesale spices and seasoning blends. You may choose from natural or organic whole Anise Star, depending on your preference. 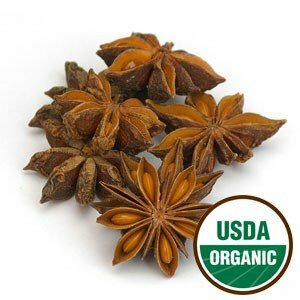 Origin: China Common Names: Chinese anise USDA Organic Anise Star, which is also known as Chinese anise and Illicium verum, is an extremely popular spice for deserts and baking. Europeans use Anise Star in cakes, cookies, and sweet breads. In the Middle East and India, it is used in soups and stews. Its licorice-like flavor is also popular in candies, and its oil is often used in fine liqueurs. In addition to its aromatic scent and delicious flavor, Anise Star also has expectorant, anti-spasmodic, carminative, anti-microbial and galactogogue properties.